I finished this guitar yesterday afternoon and attached a D-Hook to the back for hanging this morning. Let's see ..
Bought a new set of unmatched strings (couldn't find where I put the old strings; guess I must have thrown them out, which isn't like me at all). 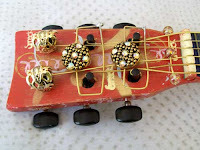 Strung some beads randomly on the strings. 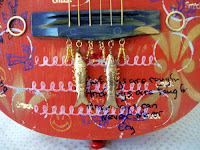 Attached two 'found object' fish and some beads to the bottom of the strings. Beads, buttons strung and weaved around among the upper section (can't remember the official name of this area). There's also some odds & ends added here and there ... some gold washers, a Fleur-de-Leis, round belt components, etc. Officially finished. I'm not planning on putting this in my shop. I like these guitars as wall art in my studio.